We live in a soundbite world. Of that, there is no doubt. Before, during, and after the Extraordinary Synod on the Family last year, the question of whether the divorced and remarried can receive the sacrament of Holy Communion was and continues to be passionately debated. Sadly, too many Catholics, including some clergy, rely only on the headlines and soundbites to inform themselves and the result of the debate has been growing confusion that somehow the Church has changed it’s teaching on a very fundamental and important issue. Here’s the full episode. It’s well worth your time, particularly if you’re weighing in on this debate. The Cardinal says that the Pope wanted to open the debate. I couldn’t agree more. Last year I wrote that the Pope sort of arranged a pre-Synod. He knew (we all knew) that there’s a lot of confusion surrounding the issue of marriage. In fact, I’m grateful for the debate. It’s brought forth greatly needed clarity on the teaching. Now, it’s a matter of continuing to clarify and teach so that the confusion is dispelled, a major task set before all of us. 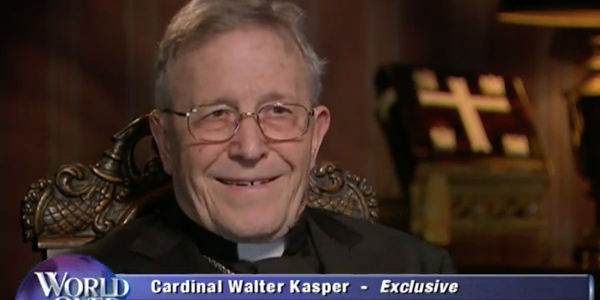 Meanwhile, many thanks to Arroyo for his excellent and respectful interview, as well as to Cardinal Kasper for his willingness to openly discuss his perspectives. I really appreciate the tone in which they engaged each other, a great reminder of how this debate should proceed. Just remember, in his own words, the Cardinal has clarified that Pope Francis has not approved his proposal. 3 Sources To Understanding Pope Francis' Encyclical "Laudato Si'"